NEW FOR 2019!!! this fabulous seaview apartment is having some considerable TLC this winter with the wooden floors being sanded and varnished and the bedroom carpets being replaced for lux grey ones, squishy underfoot! The family bathroom will have a shower screen installed and the shower will now also be overhead not just hand held. The entire apartment is being redecorated in cool Egyptian Cotton with white woodwork for a Scandi beach feel. The lighting throughout has been replaced and added to with energy efficient/environmently conscious LED. On the second floor and front of Belmont Court, this lovely two bedroom apartment looks out to the beach and the sea from the main living room and sunny balcony. 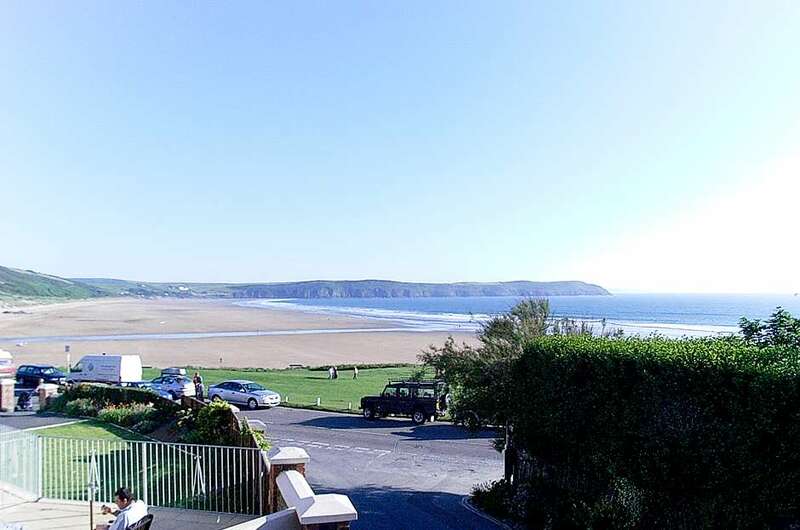 The location makes this apartment very convenient for the beach and village as it is only 100 meters from the main Esplanade at Woolacombe. Well appointed for family use the kitchen and main living/dining room are popularly open plan. The kitchen area houses washer/dryer, dishwasher, fridge/freezer, microwave, cooker and hob. There is a round dining table with 4 chairs. In the living area there are 2 leather sofas, flat screen digital TV and DVD and ipod dock. The end wall has a large window, almost floor to ceiling glass with an opening tilt and turn window/patio door to the little balcony area above the downstairs apartments’ bay window. It is large enough for a café table and 2 chairs to enjoy the view over the beach and sea. From the entrance hall are the two bedrooms and family bathroom. The master double is en-suite and a good sized second bedroom has a double and a single bed, a toy box and chest of drawers, hence this great apartment can sleep up to five comfortably. Outside there is a board store, a cold outdoor communal shower and parking space for the apartment strictly for 1 car.